Everyone needs a break sometimes and with our respite care you know your loved one is in safe hands. Caring for someone you love, while incredibly rewarding, can also be both mentally and physically draining, so it’s important to take a well-deserved rest. Alternatively you may have a holiday planned and want the peace of mind that your loved one is not struggling to take care of themselves at home. Our care homes offer respite care options, giving your loved one a change of scenery and somewhere safe, stimulating and comfortable to visit. With care plans tailored to residents' individual needs, delicious home-cooked meals, all the comforts of home and of course a little companionship; respite care can provide the break that everyone needs to recharge their batteries. As a carer you can relax knowing that your loved one is being cared for by a kind and experienced team who pride themselves on treating residents like members of their own family. Many of the people who join us for respite care enjoy being given the opportunity to meet new people, rekindle old past times, try new things and sample delicious home-cooked meals, whist retaining their independence. Read Alice and Brian Coaley's respite care case study. Alice is a caregiver to her husband Brian of 55 years who has Parkinson's disease. Find out how respite care at our Hastings Residential Care Home in Malvern provided them with the support lifeline they both needed. “Respite care is a blessing...the freedom is gives me is remarkable" - Alice Coaley. Pre book respite care today! Set in a leafy residential area, Beechwood is an attractive care home on the outskirts of Upton-upon-Severn and provides residential and dementia pre-bookable respite care. Our home has welcoming bedrooms, several lounges, a light and airy conservatory and landscaped sensory gardens. Offering residential and dementia respite care, Brambles is nestled in the residential area of Headless Cross and is just a stone’s throw from the Kingfisher Shopping Centre. Close to all the shops, restaurants and attractions Bromsgrove has to offer, Breme has a real home from home feel complete with cosy en-suite bedrooms and welcoming lounge and dining areas. Our welcoming home provides pre-bookable residential and dementia respite care. With views of the beautiful Malvern Hills, Hastings is an attractive care home located in the heart of Malvern. In addition to permanent care, the home provides residential and dementia respite care, with kindness. Within walking distance of the picturesque market town of Pershore, Heathlands provide residential and dementia respite breaks, in addition to permanent care. Providing residential and dementia respite care, Juniper House is a stunning care home, situated in a peaceful residential area of St John’s. The home has all the luxuries you’d expect with light and airy lounges, welcoming dining rooms, sensory gardens and en-suite bedrooms. A beautiful Edwardian home, complete with welcoming lounges with fireplaces, landscaped courtyard gardens and cosy bedrooms, Ravenhurst is nestled in the canal-side town of Stourport-on-Severn. We offer residential respite and dementia respite care. Our dedicated and compassionate team now provide pre-bookable residential and dementia respite care at our attractive care home in the heart of St John’s. Regent is a welcoming home with cosy en-suite bedrooms, several beautifully decorated lounges, landscaped gardens and a hairdressing salon. 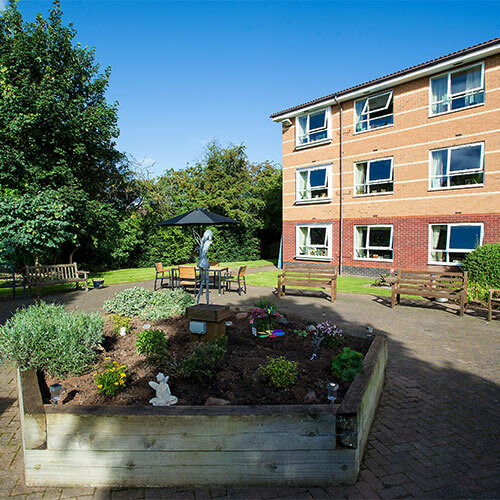 Situated in a peaceful residential area of Droitwich, Westmead’s kind and caring team offer short-term residential respite breaks in addition to permanent care. The welcoming home is complete with spacious bedrooms, bright lounges and beautifully landscaped gardens. Complete with an on-site café, a cinema room, welcoming en-suite bedrooms and large beautiful gardens, Bartley Green Lodge is located in a quiet residential area of Birmingham. Our friendly staff provide care with kindness, offering pre-bookable residential and dementia respite breaks. Providing residential and dementia respite care, Lake View is a beautiful care home, near the picturesque Holmer Lake in Telford. Our care home is complete with welcoming lounges, a coffee shop, landscaped gardens and cosy en-suite bedrooms. Basingfield Court is a beautiful newly refurbished care home in the heart of the historic Old Basing and boasts en-suite bedrooms, complete with kitchenettes, lounge areas and wet rooms. Our caring and compassionate team provide pre-bookable residential respite breaks. Our welcoming care home has spacious en-suite bedrooms, several lounge and dining areas and even a pub – The Comet. We provide residential, dementia and nursing respite care with kindness. Iffley is nestled in a pretty Oxfordshire village; our warm and friendly home offers residential, dementia and nursing respite care in welcoming surroundings. Wantage is a beautiful care home located in the historic Vale of White Horse and is complete with spacious en-suite bedrooms, homely lounges, a conservatory, landscaped gardens and a hairdressing salon. Our team provides residential dementia and nursing dementia pre-bookable respite breaks. Yarnton is located in a picturesque rural village on the outskirts of Oxford and includes spacious en-suite bedrooms and welcoming lounges with garden views. The home offers pre-bookable short-term respite for residential, residential dementia and nursing care needs. With stunning views across the main beach of Weston-super-Mare, Beach Lawns offers short-term residential, nursing and dementia respite breaks. Our home includes en-suite bedrooms, several beautifully decorated lounges and a conservatory overlooking tranquil landscaped gardens. Furzehatt is nestled in the leafy suburb of Plymstock and offers residential, nursing and dementia respite care along with a host of regular activities and our dedicated and compassionate team. Located in the beautiful residential area of Durleigh, The Rosary is a stunning home with spacious en-suite bedrooms, several lounges and sensory landscaped gardens, offering pre-bookable residential, nursing and dementia respite care. Don Thomson in Harwich, is a warm and friendly care home with kind and caring staff. Our home offers short-term residential and dementia respite care breaks. Our stunning care home Meadow View, situated in the village of Hersden, boasts luxurious living in warm and welcoming surroundings and offers residential and residential dementia respite care breaks. Shaftesbury Court is an attractive home located in Erith with easy access to London and has spacious suites complete with kitchenettes and lounge areas. Our home offers pre-bookable residential respite care. Shaftesbury House in the historic town of Ipswich offers residential and dementia short-term respite care with kind and caring staff, homely lounges and a dining area serving seasonal home-cooked meals. Upton Dene located in Upton, offers short respite care breaks in stunning surroundings. Our kind and caring staff are on hand 24/7. Our home has regular diverse activities including ‘Fizzy Fridays’ with bubbly and nibbles and ‘Get Active Feel Good’ sessions. Located in Streatham Vale, Aashna offers culturally specific care with kindness in a welcoming setting. Our dedicated team speaks a variety of languages providing residential and dementia respite care breaks tailored to residents’ cultural and spiritual needs. With welcoming lounge and dining areas and a dedicated and compassionate team, Riverlee, which is situated in the District of Greenwich offers residential, dementia and nursing respite care breaks. Find a care home close to you online, or contact us and we can arrange for you to visit a suitable respite home in your area.